During this process we purchased and tested soy candles throughout the USA. After 3 years of testing we present the finest candles available today. Renewable - Soy wax is made from soybean oil which is a natural resource American farmers - Soybeans are grown in the USA and not dependent on foreign oil which keeps dollars in our country. It benefits our economy and creates U.S. jobs. Soy wax candles are made from soybean oil, washes up with soap and water, easily removed from materials if spilled. 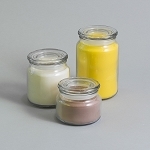 Cost Effective - A point which sometimes isn't included in many lists of the benefits of soy candles. You may be shocked by this point, but in many cases soy wax candles can be more cost effective than paraffin. Not only in quality, but in quantity too. Soy not only burns cleaner, but slower too. A soy candle can burn up to twice as long (sometimes even more!) than paraffin, giving you twice the candle. Our mission and passion - To constantly improve our products to provide the finest quality handmade and handcrafted products available. We hand craft and hand pour each candle one at a time. Most people know that soy and essential oils soap is healthy for the skin and that it can be very good for you to use, however, there are additional benefits you can gain by using this soap that you may not be aware of. Soy and essential oils soap: can be more effective at clearing up acne and skin problems than any other kind of soap or skin care products. Even the more expensive products in many cases will not work as well. This kind of soap can be used not only on the skin but also as a shampoo. In many cases it may even work better than normal shampoo. The soy as well as the oils in this kind of soap can do wonders for all types of hair.￼This soap can be used to clean your house. You can get ￼stains out the carpet, clothing and other items. You can also use it to clean your bathroom and kitchen. The soy in the soap works wonders to eliminate stains that you may not be able to get out via any other kind of cleaning product or detergent. Most other kinds of soap has chemicals and other additives in it. While many of these are not harmful in small amounts over time by using a lot of them, you can develop allergic reactions and complications. This is especially true with cheap store bought brands. While they may be inexpensive, over the long haul they are not healthy for you. Soy and essential oils are used for aromatherapy and for relaxation. You can use soap with these ingredients in them to relax and to reduce stress among other things. The Handcrafted Soapmakers Guild was formed in 1998 by a small group of enterprising soapmakers. The first annual conference was held at the Woodspirits Farm in Ohio. Since that initial gathering the Soap Guild has grown in terms of both numbers of members and outreach into the community. The HSMG now has members in nearly every US state and territory, and many other countries. The mission of the Handcrafted Soapmakers Guild is: To promote the handcrafted soap industry; to act as a center of communication among soapmakers; and to circulate information beneficial to soapmakers. What does 'CandleSafety' look for? 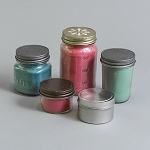 Are lead wicks used?Is fragrance specifically designed for use in candles?Is coloring specifically designed for use in candles?Have all formulas been thoroughly tested?Are containers specifically designed for use in candle making? If you see a candle maker or supplier with the "We Checked" logo, you can rest assured that they have answered these questions satisfactorily. 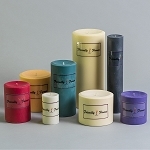 We use only one of the safe, lead free wicks listed above in your candles.We use proper caution labels on your candles. We properly test burn your candle products before selling them.